That idea that the sense of smell is the most powerful memory trigger never quite worked for me until 9 pm last night. 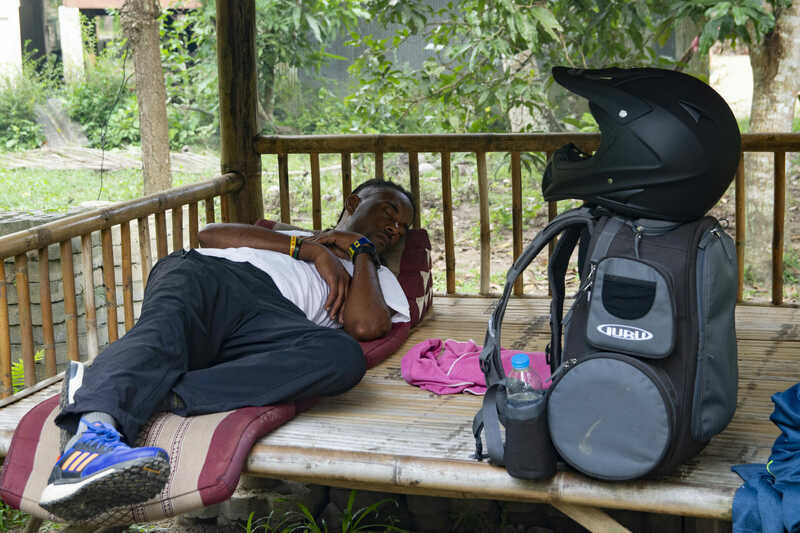 Just after the Singapore–Koh Samui flight touched down in the dark, they opened the doors to let air in from the Gulf of Thailand that carried the faint whiff of flowers, rotting fruit, smoke, cooking, and sewage. It was hardly overpowering like the Denpasar markets on a hot day, but, still, that aroma along with the gentle humidity lit up my mind with memories of traveling southeast Asia going back more than 30 years. Nigel came here 13 years ago after bailing on a video game developing career with a full-blown, arm-scratching, 3-month-old disc golf addiction and nowhere to play. It didn’t take him long to source some land and start building a course. It’s a busy little course too. 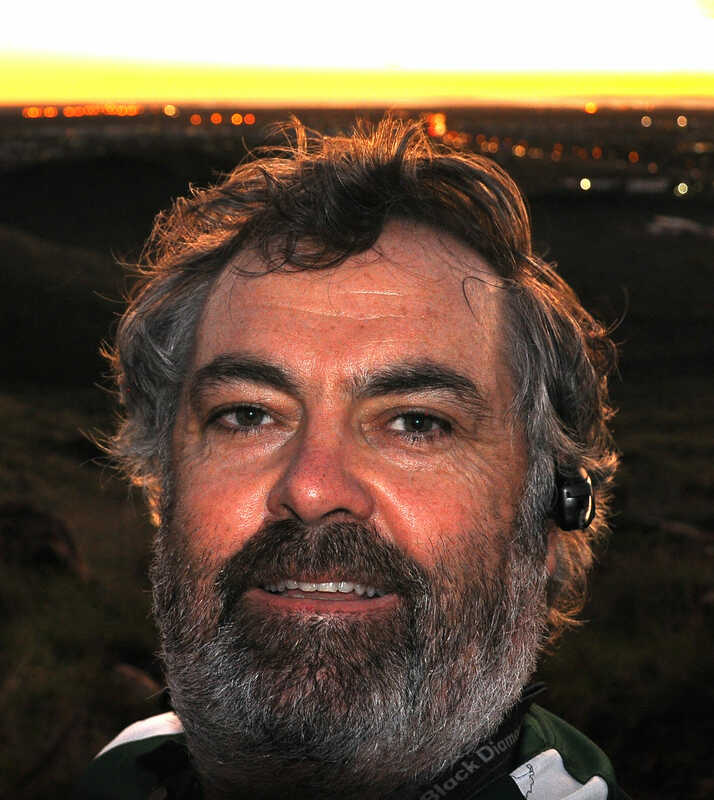 There’s a good number of expat locals, some actual locals — including the 936-rated women’s pro View Georgiou who regularly beats all comers here — and a steady stream of tourists who seem to be mostly Finnish. The open-air clubhouse, which also serves as a pro shop and restaurant, has a lively hubbub of disc golfers all talking about one thing (did someone switch brands recently? 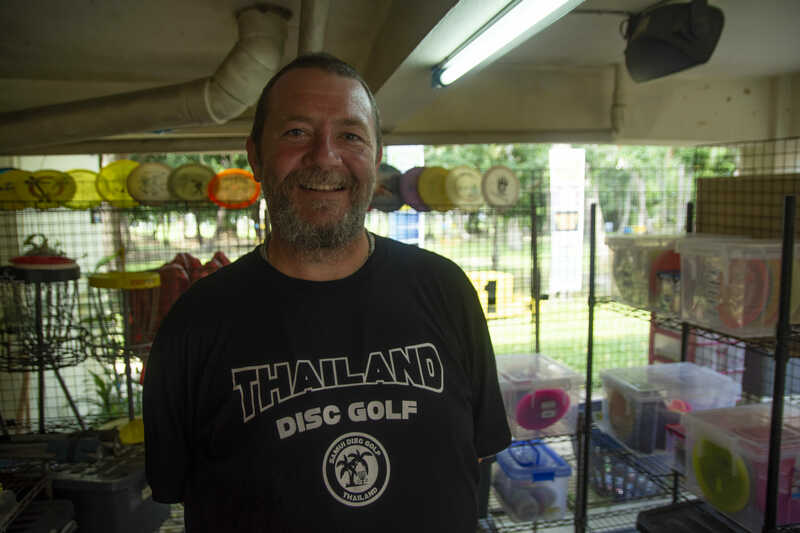 ), with the influx of pros who are here for the upcoming Samui Swine Classic VI – The Hogfather, presented by Dynamic Discs. I don’t know the financial details of many of the other private disc golf courses in the world but it’s fair to assume that they aren’t making their owners stupidly wealthy. But with the steady traffic of visitors, the pro shop, and the restaurant, this one, Nigel concedes, is becoming viable. Look around at the little hive of activity and there’s a certain whiff of “things to come” in the air. 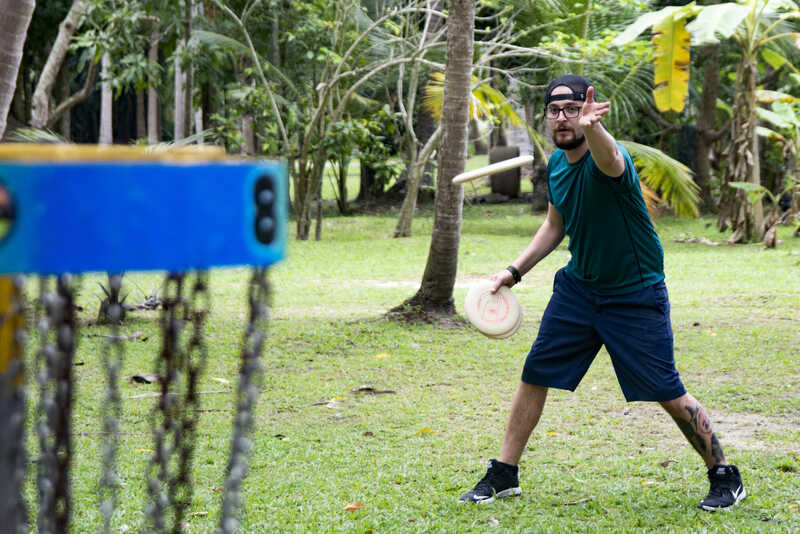 Exotic travel, SE Asia, and disc golf just seem like a potent mix to me. Philo Braithwaite sits dead-still with his eyes closed like a Californian Buddha as the chatter goes on all around him. He’d just flown in early that morning and is fighting to stay awake. Just when I think he’s gone and is going to topple over, he’ll open an eye to make a comment or answer a question. He’s hanging on to the conversation by a thin thread. This is his third trip now. Not comfortable enough though. “I think I need a disco nap,” he says, as he shuffles off and stretches out on the day bed in the corner under the shade of the palm trees. On his bag next to him is the sign of a true SE Asian travel old-hand: he brought his own motorbike helmet. Owens also switched sponsors in the offseason, from Latitude 64 to Innova. Then there’s the sudden late afternoon rain that arrives like someone has turned on the shower. It softly taps on the awning roof, palm leaves, and thick grass. As suddenly as it starts, the tap is turned off again and there’s a fragrant smell of smoke in the air as the daily burn commences — of rubbish and the excess plant matter that grows at an astounding rate here. As I weave back to the hotel along a bumpy road, I see all matters of things crammed on to the little scooters that own the roads here: whole families, furniture, livestock and, then, among the organic chaos of an Asian road through the jungle, around a corner, comes a blonde couple, both with disc golf backpacks. A sign of things to come. 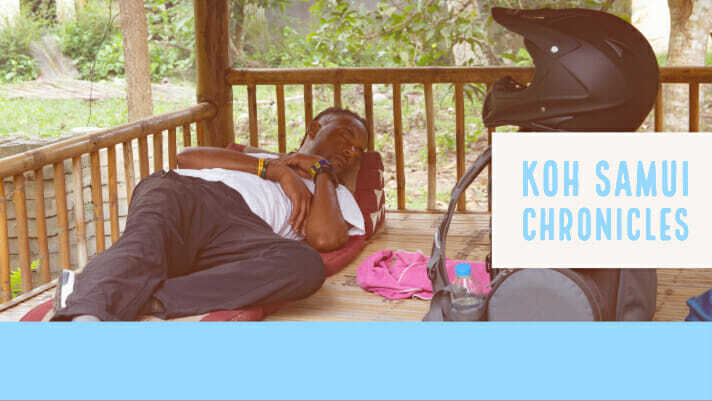 Comments on "The Koh Samui Chronicles – Part One: A Sign Of Things To Come"